At Justuno we have separated mobile and desktop promotions for more control over design. Your mobile website experience is different so your promotions should be designed accordingly. 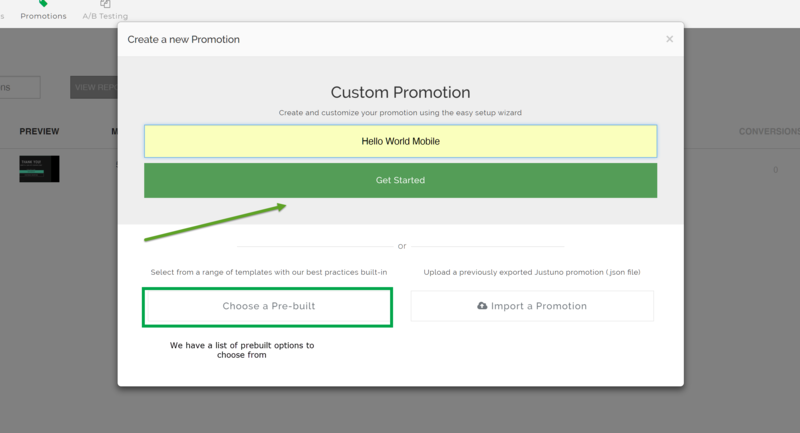 Here is a walk through on how to create your own mobile specific promotion! TROUBLESHOOTING TIP FOR NON-RESPONSIVE SITES: If your website is mobile non-responsive, altering the image size to our template will result in the promotion appearing extremely small on your mobile device. To avoid this, create a desktop promotion you would like on mobile and duplicate it to mobile WITHOUT altering the size to fit our mobile template. This will allow you to have a fitted promotion on mobile devices! Check out this video or follow the steps below! Step 2.) Type in a promotion name and hit "Get Started"
Step 8.) Edit the pop ups text to fit the needs of your promotion. For more information on the design canvas use this article and make sure to set up your coupon code before heading to step 2 of setup! Step 14.) Integrate your email marketing application to ensure that all emails flow directly to that service. Here is a link to our integration guides. Step 15.) Hit publish and your mobile promotion is live!